Bust measurement, even more than waist measurement, is critical when determining what size shirt or blouse to buy. Ignore the manufacturer's sizing system; we've all seen instances where a size 8 from one brand is a size 6 --- or even a size 10 --- in another brand. If you try it on and it fits across the bust and is okay across the midsection, buy it. You can even find out if a shirt or blouse is likely to fit without even trying it on -- which saves time and frustration on a long shopping trip. Determine your bust measurement. In the privacy of your own home, before you leave for the store. measure your bust at the "biggest around" part. 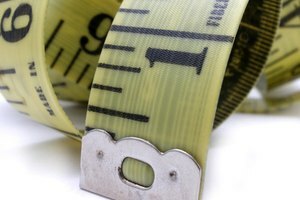 Write the number down and take it --- and your measuring tape --- with you. Decide where your bust is in the average shirt. For most women with good bras, the "biggest around" part of the bust is just below the armpit on most shirts. Try on a few of your favorite shirts and see where your bust falls on the shirt --- at the armpit, or perhaps a couple of inches lower than that. Write that down on the same piece of paper that you wrote your bust measurement on. Choose a shirt. While at the store, choose a shirt or blouse you like in a size you think will fit you. Measure the bust area of the shirt. Lay the shirt flat, front-side up, on the rack of clothes. Measure across the front of the shirt where your "biggest around" bust is. Double that number (one measurement for the front, the other for the back). If the final number is larger than your bust measurement, the shirt should fit. Try it on and see if you still like it. If it doesn't fit, go up a size. Pay attention to the fabric content of the shirt. The more cotton the fabric contains, the more likely the shirt or blouse will shrink in the wash --- and all your careful measuring will have been for nothing. If you find a cotton shirt you like, buy the next size up to allow for shrinkage.